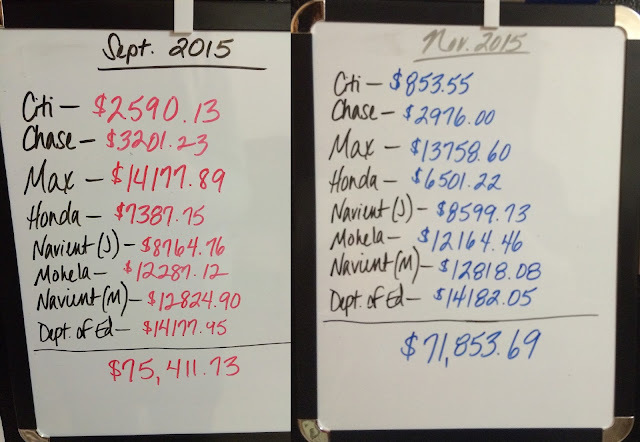 It's been just over four months since I opened up about our $70,000+ debt. In that time, we've made a notable amount of progress toward our debt-free goal, and I thought it would be fun/inspiring/motivating to share a detailed update of said progress. Early August 2015. Matt and I sat down with our computers, checked the outstanding balances on each of our debts, listed them one by one in an Excel spreadsheet, and faced the numbers until we made ourselves sick. Our grand total that day? $75,411.73. I still feel sick. I feel more sick. I hate that number. The day we realized the depth of this pit, I didn't have a job. Despite applying everywhere that was hiring, I had gotten only one interview, and I was over-qualified for the position (a grocery store clerk). I was jobless, we were scraping the bottom of our savings account, and $75,411.73- that massive, insurmountable sum- towered over us. We were getting pretty scared. Though I didn't want to abandon my new B.A. in English and go back to working as a nurse, our little family finance meeting got me moving. I got a Missouri nursing license and applied to every horrible-sounding LPN job advertised. I printed out resumes and tried the door-to-door technique. And by the end of the month, things started changing. As silly as it sounds, the fortune cookie lifted my spirits. I felt encouraged and hopeful. Quite eerily, that same day, I got a phone call from a doctor's office who had received my application and wanted to interview me. Later that same week (actually on the day of the doctor's office interview), I got a phone call from a nursing home who also wanted to interview me. I don't know what kind of dark arts that Chinese restaurant is dabbling in, but um...I was offered a job with the nursing home the first week of September. September was a major turning point for us. My new job more than doubled our income and allowed us to stop chipping away at our savings. During my last year or so as a school nurse, I was careful to make sizable deposits into my savings account because I knew I would probably be unemployed for a while after the wedding. I actually managed to accumulate over $4000, and though that sounds like a lot, we burned through it fast. For the months of July, August, and September, I was forced to withdraw around $1200 each month to pay our bills. We didn't know what we were going to do after that, because after September 1, we just over $1000 remained in our savings account. And that $1000 needed to stay there as an emergency fund (that's Dave Ramsey's Baby Step #1). The painful truth, all out in the open. Our Excel debt list. And of course I saved that magical fortune. A dry-erase board to be updated each month so we can visualize our progress. September was our official starting point. Day Zero. We started making an actual dent in that $75,411.73 when October rolled around. Excited and highly motivated to get our debt snowball rolling, we had a garage sale the first weekend in October. It was the coldest morning of the season. I mean, there was a frost advisory and everything. But we used this to our advantage and set up a hot beverage station (which we included in our advertisement on Craigslist). Also, we set up a little bed for Annie to boost our likability and lure in customers socialize her and get her more comfortable around new people. I think her presence helped. Who couldn't buy something from a cute little crippled pup huddled next to a heater for warmth? Though our garage sale looked pretty pitiful, we actually ended up making almost $280. The books, movies, and CDs we didn't sell went to Hastings, a local buy-back entertainment store, to sell for cash or store credit. All the cash went straight to the bank, then onto our smallest debt- Matt's Citi Card. This was in addition to the $50 minimum payment, plus all the extra "snowball money" leftover from our paychecks after our fixed and adjustable expenses, which amounted to around $600! 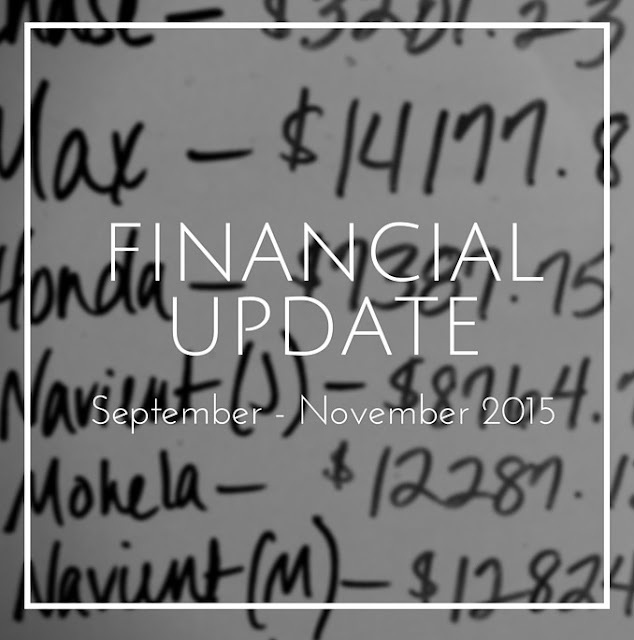 In November, we tightened our budget a bit and sold more stuff. I sold a necklace on eBay for $20 and Matt sold an old saw on Craigslist for $80. Another $100 extra for the snowball. Unfortunately, I had some medical expenses during this month that set us back about $300, but we cut corners enough until we made a decent snowball payment on the Citi Card. That's where it stands now. We won't make our December snowball payment until the end of the month, when all our extra income has been totaled up. But so far this month, I've sold an old iPhone on eBay for $115, Matt sold a video game console on Craigslist for $80, and we've told our families we just want money this Christmas to add to our snowball. Soooo, if we're extra careful, we should be able to pay off the Citi card this month! That's just THREE months of following Dave Ramsey's method. Pretty awesome, huh? I really want to start giving updates like this on a monthly basis. It would really help us stay on track, and it might even encourage someone out there reading this blog. Plus, we've calculated that, if we keep scrounging up at least $600 in snowball money each month as we have been, we can be free of credit card debt and car payments by May 2017. That's 18 months from now. I could do a sort of monthly countdown. Man. No credit card or car payments. Do you have any idea how much take-home pay that would free up each month?!?!? We could actually obliterate those monstrous, life-controlling student loans in a few years while putting money in the bank for the future! I'm starting to get a little of that "gazelle intensity" Dave talks about, where you get so incredibly mad at your debt, you work as hard and fast as you can to rid it from your life as quickly as possible. We look around our house all the time going, "What can we sell?". We've been talking about opening an Etsy store and setting up a booth of homemade goods at next spring's farmer's market. We've even been discussing second jobs. Second. Jobs. It's insane! We're just seeing how quickly this snowball thing could roll if we really let it.